The FRC 3003 Combi combines two trapping functions: one is achieved by the UVA light of the original iGu-electronic BL3000 lamp. 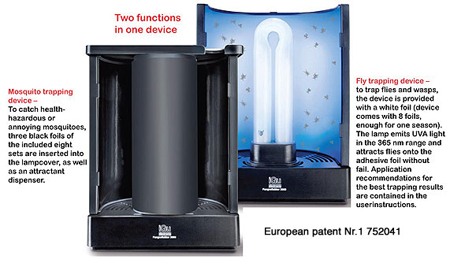 The 365 nanometre-UVA-emission of the lamp exerts irresistible pressure to approach the device for houseflies (Musca domestica), wasps and other detrimental, annoying, unhygienic and even health hazardous flying insects. The FRC 3003 Combi catches them on the white adhesive foil with dead certainty. In bedrooms, living and dining rooms, in offices, in food stores and restaurants it provides a living environment free of flying insects. One device per room up to 70m² is adequate. The COMBI can be easily and quickly re-equipped to the second trapping function as a mosquito trapping device with the component included in the display box. This component is included in the same display box as an attractant dispenser and black adhesive foils that it has to be equipped with. The scientific realisation that black surfaces on devices and therefore also black adhesive foils, are preferred by mosquitoes than bright coloured ones, has been harnessed in the construction, as well as the heat produced in the device that radiates at approximately 30°C to the attractant dispenser and the black adhesive foils. 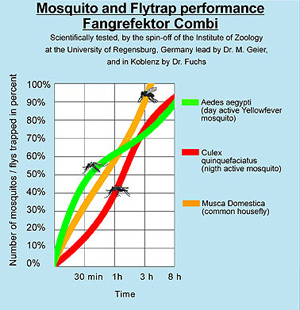 The combination of all attractant components increases the trapping performance for extermination of mosquitoes. The well known iGu FANGREFLEKTOR fly trapping device FR 3003 has proven successfully over many years. More than 1,300,000 white adhesive foils have been used worldwide, proving its popularity and success as the leading fly trapping device for home or office. The in the FRC Combi applied attractants as well as the UVA rays emitted by the iGu electronic BL3000 lamp, are completely harmless to humans and animals. The black and white adhesive foils are biodegradable and environment friendly.